Ventspils is popularly imagined to be the best managed city in Latvia. Outside the capital, which does have its concentration of big businesses and tourist draws, this is unusual. For Latvia, as the poorest country in the Baltics, one of the poorest in the European Union, as one hit extremely hard by the financial crisis – and whose return to growth owed a lot to driving down living standards – this means a lot. What if there was a future other than managed decline and emigration? Frequently, in discussions with people about the depopulation and decline of their town, and what they can do about it, they will point to Ventspils as an example of what could be done. Simultaneously with being considered the best managed city, it is considered to be the most corrupt city in Latvia, with its long serving mayor and former head of the local Communist Party, Aivars Lembergs, seemingly perpetually under investigation for dubious deals and kickbacks, although it has never resulted in him actually being prosecuted – or losing an election. Although Ventspils has a relatively small Russian minority, Lembergs has been unexpectedly sympathetic towards the erstwhile imperial overlord, claiming that the presence of NATO forces could lead to a military occupation of Latvia, and recently jetting over to Russia for talks with Dmitry Medvedev – especially curious given that “de-Sovietisation” of the city’s aesthetic has been part of his programme as Mayor. I had the unexpected pleasure of a tour of the city from its city architect in summer 2016, a surreal experience of a city managed as a combination of industrial company town, theme park and children’s playground. If being more like Ventspils is a possible solution to the rather sad, worn look of many Latvian towns, it is worth finding out exactly what the alternative is – and how they managed to fund it. Ventspils’ history can be read in the glossy guidebook published by the city council, a contemporary equivalent of the Progress Publishers Guides that would tell you about the achievements of the Soviet republican capitals. The current edition, Ventspils – 700+25, begins with a valedictory foreword from Lembergs: “we have built ourselves a city, a city where we and others feel good … we carefully consider all new things and choose only what is best for our well-being, convenience, comfort, urban aesthetic and growth”. The history told therein is the usual attempt to create a monoethnic narrative out of Kurzeme, once the multicultural imperial province of Kurland, shifting between the land of the ancient Livonians, to the Grand Duchy – a German governed autonomous part of the Polish-Lithuanian Commonwealth, whose fleet once claimed colonies in West Africa and the Caribbean – though the Russian Empire and independence. More controversial matters are avoided, from the 1905 revolution, when Ventspils – Windau, Vindava – erupted, like all of Kurland, in a ferocious socialist uprising, before being brutally pacified by Tsarist troops – to the brief 1919 Latvian Soviet Republic. The silence extends to the Holocaust, when Kurzeme’s large Jewish population was exterminated, largely by the Latvian Auxiliary Police. However, it does take time out to note the “genocide of the Livs”, apparently caused when the Soviet army forced the Finno-Ugric speaking Liv population out of their fishing villages when they militarised the Baltic coast (undoubtedly a bad and cruel thing, but an odd one to consider more important than the murder of almost every single Jew in the city). History then leaps from 1944, and the flight of the liberal Latvian Central Council to Stockholm, to the 1980s environmental movement that would lead, uniquely, to independence. As a narrative, there’s nothing in the story that Ventspils tells about itself that could possibly offend a Latvian nationalist. That mention of the environmental movement, however, is crucial for understanding what has made Ventspils the strange “success story” it is today. In the 1970s, an oil terminal was built here with the assistance of the American investor Armand Hammer and his company Occidental Petroleum, for the export of fossil fuels from the Soviet interior through the Baltic to northwestern Europe. 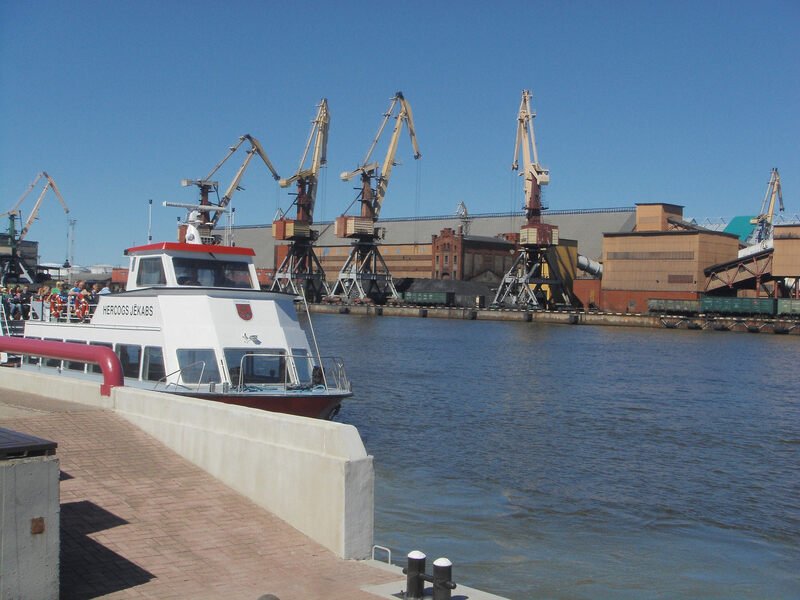 The large Free Port of Ventspils is still based around this, and it has been a Special Economic Zone since 1997, during which it has become a highly profitable capitalist enterprise. It is the Oil Terminal that first makes it obvious quite what sort of a town you are in, on arrival from the bus station. Nearby is a small square, built around the Lutheran Church, a diminutive piece of Petersburgian classicism, and an ensemble of little houses, wood and stucco, leading down to the historic market square. As you step down towards the market, you can’t help but see the Terminal – a continuous metal conduit, stained red and black, suspended on tiny little metal struts, connected by pipes and gantries to domed containers, leading further to spindly, rusty cranes, and in the middle of all of this, dwarfed, a couple of grimy, late 19th century dock buildings. The sudden shift from the Lilliputian scale of the houses and the church to this Constructivist monster is the most remarkable thing in the town, and a constant reminder of what exactly it revolves around. In front of it, dotted along the quayside promenade, and the passenger port that can take you to Sweden, North Germany, Denmark, is a series of fibreglass cows. They have been decorated in a variety of costumes. Suitcase cow, decorated with stamps and stickers from foreign destinations. Riot police cow, with shield and armour. There’s also a little group of souvenir shops, where you can buy a mug with the face of Aivars Lembergs. I’m not here to look at the port, rather as one of a group of writers taking part in a residency in nearby Kuldīga, on a visit to the “Writers House” opposite the Lutheran Church; you can tell it is the writer’s house, because there is a giant sculpture of a quill outside, another example of the public art that has been bestowed upon the city in the last ten years. Here Daiga Dzedone met us, the chief architect of Ventspils, who in that capacity has been responsible for much of the makeover the city has received. Very kindly she offered us a tour of the city, so we could see how it had been transformed, as she described, from a depopulating and extremely polluted industrial port, its very air poisoned by ammonia, with a town centre people would actively avoid due to the proximity of the dirty, filthy dangerous industry, to a local tourist draw with a blue flag beach, a public art programme, and very unusually for Latvia, a growing population. She avoids taking us around the oil terminal, but it is clear this is where the money for it all has come from – that, and the European Union structural funds that have been ploughed into the country since accession, which are much more conspicuous here than in the pot-holed, half-decrepit, financial crisis-stricken boulevards of other Latvian cities. Some of the new work has taken place in the town centre; next to the Writer’s House is a neat little Municipal Library designed by Juris Poga, which bridges between a historic building and a new, mildly modernist wing with wooden slats; nearby is the Samrode Building, a very decent little office block by architects Krists Kārkliņš & Arhitektūras Birojs, in a knobbly, Hanseatic brown brick. In front of these is a hilariously walrus-faced statue of a Red Army general, Jānis Fabricuss, one of the very many Courlanders to throw in his lot with the Bolsheviks. Its survival is surprising, but then the Red Riflemen do still stand guard in the centre of Riga. The strident working-class politics that the riflemen stood for is harder to find. Rather than lingering here, Dzedone whisks us off to the Jūras Vārti House of Culture on the other side of the docks. It’s an area dominated by tiny wooden houses, which, at the turn of the century could be built here at a discount, as a means by the Tsarist government to attract residents to an area that, even then, was beset by pollution, with the prevailing winds blowing in precisely this direction. The result is a little fragment of the sort of villagey townscape you can find in somewhere like Kuldīga: winding streets, recently repaved with EU money, between modest, one-storey clapboard houses, painted yellow, red, blue, green. She doesn’t linger on these, though – the point is the new building, which is in fact a remodelling and expansion of a typical Soviet House of Culture, with the same sort of multifunctional high culture you’d have got in one those – classical music, opera, theatre, maybe a bit of panto to bring in the receipts, and some very bad painting exhibited on the walls. The no doubt worn and creaking Soviet structure has been overlaid with shiny but cheap-looking materials, everything bright and wipe-clean; we get a rather too extensive tour, shown everything about it from the mechanism that lowers and raises the stage to the small and large dressing rooms (the latter for stars, the former for dancers and the like). The “humanisation” of the Soviet legacy exemplified by the House of Culture is one of the main concerns of the town architect – several districts of Khrushchevki have been renovated, in the manner common in Poland or the Czech Republic, with pastel colours and garish patterns, which seldom happens in Latvia – “apartment buildings are transformed entirely, as traces of Soviet legacy in the architecture of Ventspils are wiped away by a more modern, better-looking design”, says Ventspils – 700+25, but the spacious, parkland layouts are untouched by new construction. The landscaping of the green strips between with fountains and lots and lots of flower arranging feels very Soviet though – the place it most resembles in the region is the Baltic states’ apparent antithesis, for its institutionalised Communist nostalgia – Belarus. Affluent, clean, conformist, fully employed, and run by a very popular big man. There are un-humanised parts of the city, particularly one big housing estate of untouched panel slabs, which could be absolutely anywhere in the USSR – these, Dzedone tells us, are known as the “Belarus Station”, as they originally did house workers from the slightly more southerly Soviet Republic. The streets have been repaved, but the seams between the panels here are visibly coming loose. On the other side of the Free Port is another large Soviet estate of the 1980s, and a much more interesting one – the standardised type, but the Latvian SSR standard rather than a generic Union one, and superior to it both functionally, and, with their expressive brick details, visually. Dzedone tells us this one is soon to get the styrofoam and lime green paint treatment, and here, if nowhere else in the town, it would be a shame. Oddly, however, the sense we get from the city architect’s version of the city is that buildings don’t really matter. What she wants us to see are things like the camp-sites in the woods, which apparently have a several months-long waiting list, and are indeed very attractively designed, in lightweight, crisp little chalets under pines. She wanted us to see the endlessly sprinkling fountains and incredibly literal sculptures – around ten giant anchors, on all the entrances to the beach, a big chair made up of chains by the car park. The several sports centres, and a seemingly interminable quantity of playgrounds. Cynical local opinion puts these down to Lembergs having recently sired. No child, apparently, ever has to queue for a slide or a swing in Ventspils. The huge amount of children’s infrastructure – from a ski-jump to a genuinely rather delightful children’s railway running between the beach and the woods, which doesn’t quite compensate for the closure of the city’s railway station – helps make the place feel a tad infantile, as if it were planned not to accommodate children, but just for children. For them, too, there is little space for surprise or discovery – everything is spelled out. Architecturally, some of the new work in Ventspils is excellent, especially by contemporary Latvian standards. The City Council itself is housed in an eco-friendly HQ (in an oil town! ), with a subtly drizzly, green screen draped across it; it’s placed in a very affluent looking villa district, with wooden terraces and the rangy Arts and Crafts houses of the disappeared Baltic German bourgeoisie. Today the area is apparently popular with Russian émigrés. Similarly interesting is the suburban Pārventa Library, in a workaday area of renovated tenements. Two brittle curved steel and glass curves interlocking around a multi-storey atrium over benches with beanbags, to a competition-winning design by INDIA architects – this one even made its way into the English-language architectural digests. The confidence of the design is somewhat contradicted by the awful paintings of nudes and landscapes on the wall, the sort of stuff a street-corner tourist painter might think twice about exhibiting; it all feels oversized, the readers made tiny by the space. With a big EU funded concert hall slated to supplement the Jūras Vārti House of Culture, there’s almost a sense of over-provision of culture here, more than a town of 40,000 people could really need. There is a lot of cultural spending, but no sign of the “creative class” or anything remotely bohemian or “alternative”. In this too, the town resembles a Baltic Belarus; Lukashenkaism without the need for the KGB. Owen Hatherley is a writer based in London and the author of eight books, most recently Landscapes of Communism (Penguin 2015), The Ministry of Nostalgia (Verso 2016) and The Chaplin Machine (Pluto Press 2016), which is based on his PhD thesis. This article is taken from the one-off joint issue U19-Deep Baltic, a collaboration between Deep Baltic and the Estonian Urbanists’ Review. The print version is available now from selected outlets in Tallinn and Riga, and the full issue can also be accessed in English and Estonian here. © U19-Deep Baltic 2017. All rights reserved.